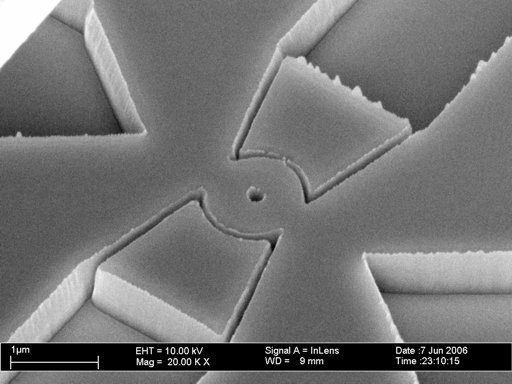 Gallery of structures and devices created using electron beam lithography (EBL) or focused ion beam (FIB) milling with the nanonic eLitho system. Traps for bacteria patterned with EBL into PMMA. This simple structure demonstrates an intersting usage of EBL for biological appplications. The magnetotactical bacteria have been colorized for better identification. 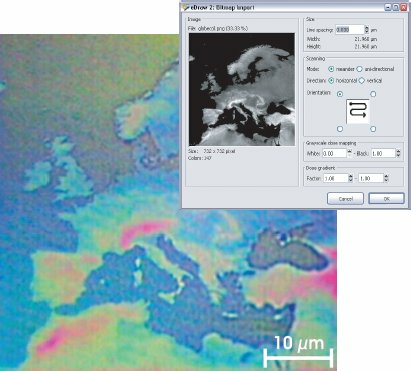 World map written into a thin layer of PMMA (coverd with 5 nm Cr): The eLitho package allows to write complex polygons with many edges and arbitrary scan-direction. 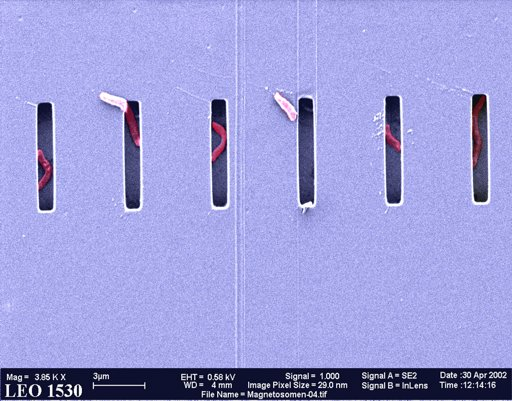 Semiconductor microtube cut into slices of different thickness by means of a direct focused ion beam milling process. 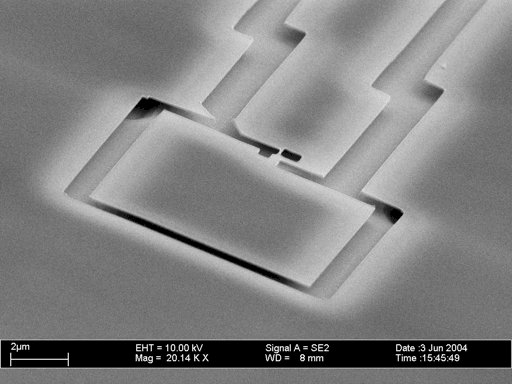 The tube itself was fabricated using the self-rolling mechanism of a thin strained semiconductor bilayer and wet chemical etching-processes. Fabrication: D. Stickler, T. Kipp, S. Mendach, W. Hansen, D. Heitmann and H.P. Oepen, Physik, Universität Hamburg. 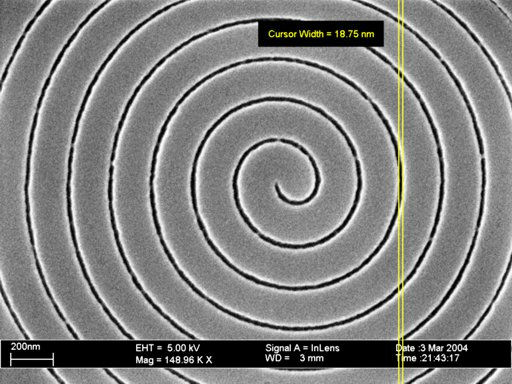 This spiral line of less than 20 nm width was written using a PMMA resist layer of about 100 nm thickness. 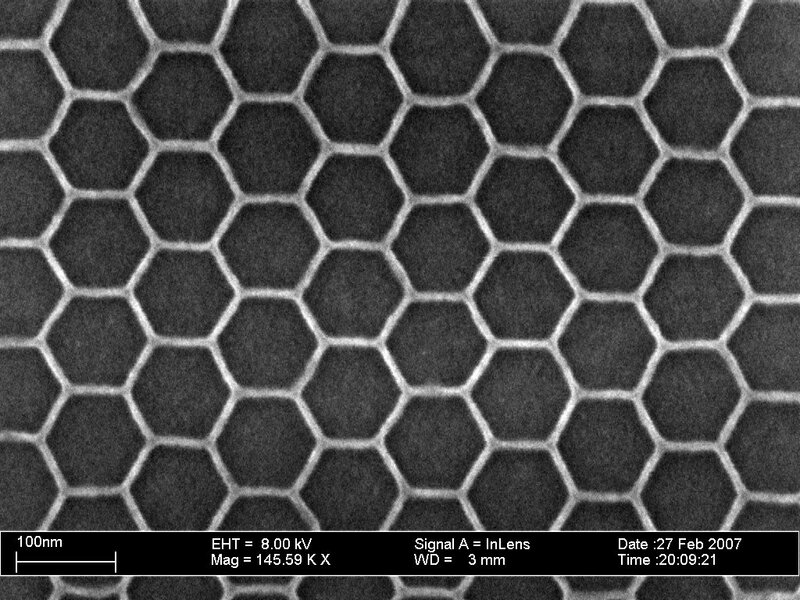 The resist was coated with 5 nm Cr after development in MIBK. 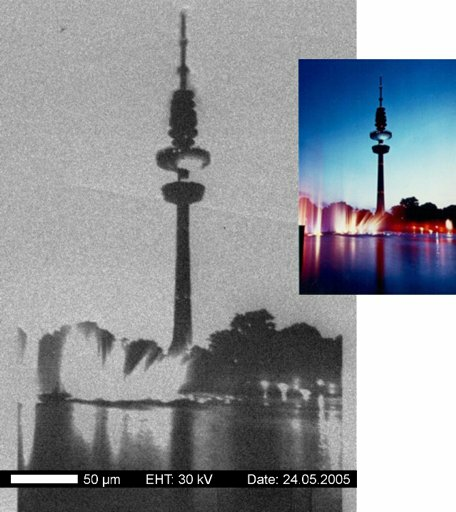 This three-dimensional pattern of the Hamburg radio tower was milled directly into a Permalloy-film of 20 nm thickness. 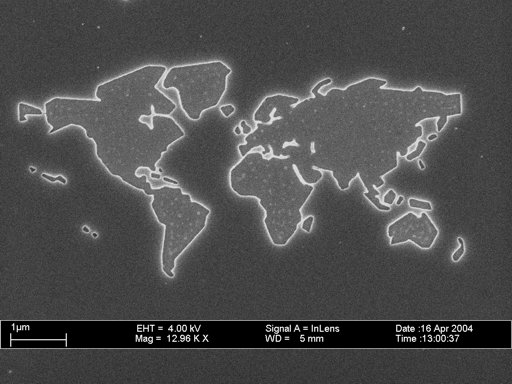 The original image was translated into a greyscale image which served as a height encoded master for the focused-ion-beam etching process. Fabrication: D. Stickler, R. Frömter and H.P. Oepen, Physik, Universität Hamburg. This GaMnAs ring-structure is written as a sequence of line-elements employing PMMA as negativ resist, followed by reactive ion etching. 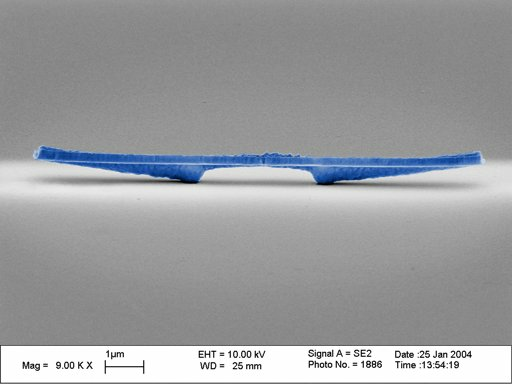 The line-width of the structure remains within 30 nm and its height amounts to more than 300 nm. 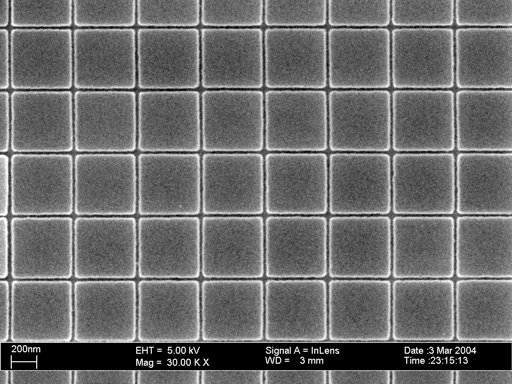 Gray level image import for the 3D preparation of e-beam resist. 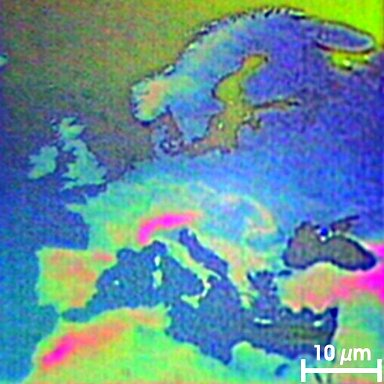 Optical micrograph of a 3-dimensional map of europe. This PMMA pattern was prepared using an imported gray-scale height map of europe. 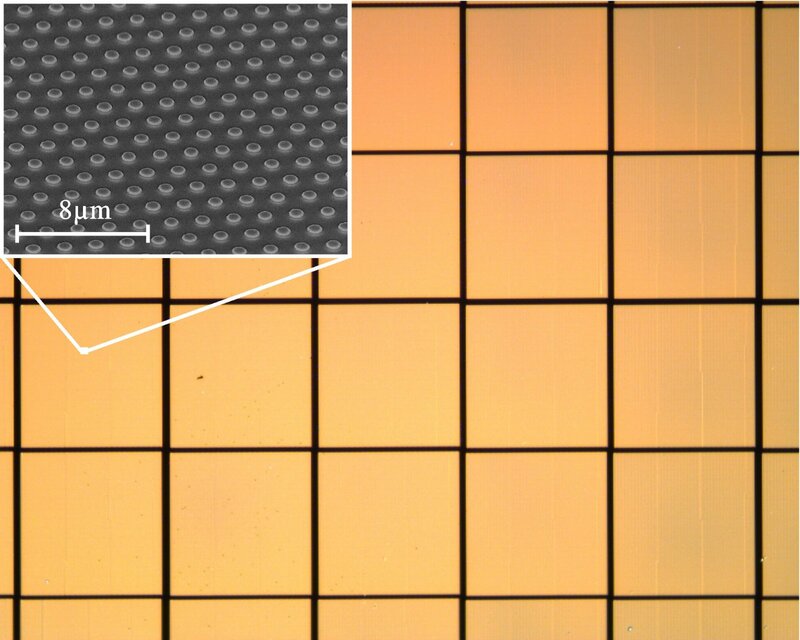 As the depth of the developed PMMA is not proportional to the dose, the eLitho software package provides a module for mapping non-linear dose functions. 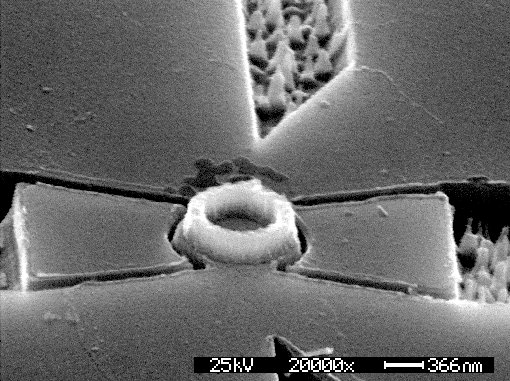 This shadow-mask is fabricated from Germanium, whereas the sacrificial layer consists of temperature insensitive synthetic material. 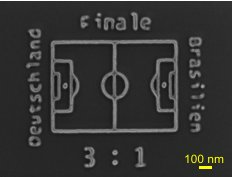 K.Wagner, Universität Regensburg wrote this football pitch on the occasion of the world championship 2006. 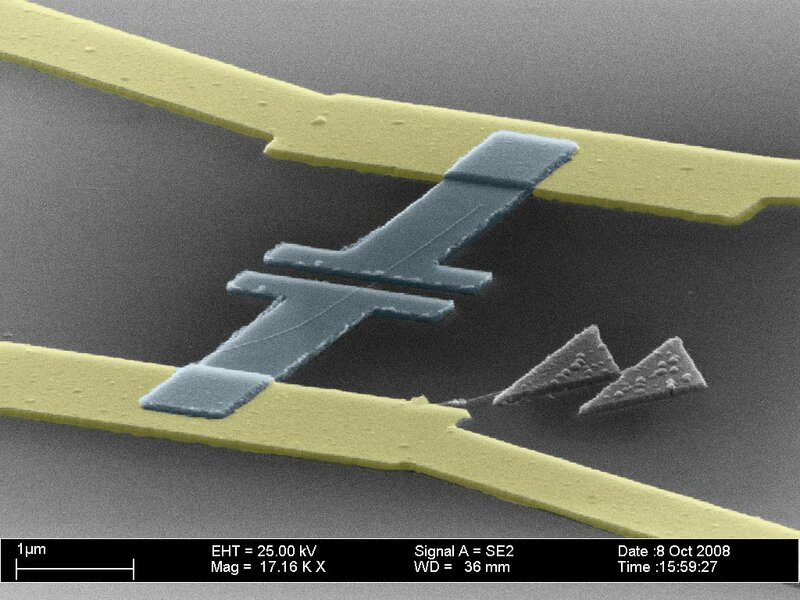 It measures only 1000x700 nm. Although the result of the here shown fictive final is written very small, it seems to be a great desire of the creator of this structure. 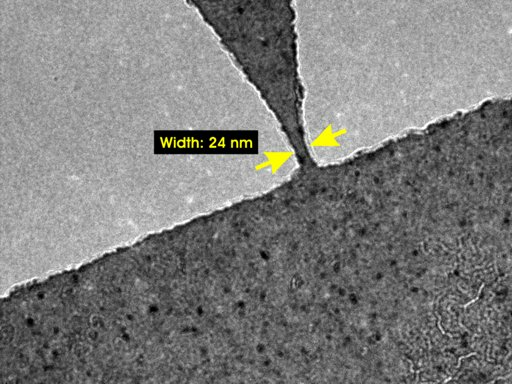 Ni Point Contact (dark area) was structured applying a lift-off process on a Si3N4 membrane substrate: Using a membrane prevents a pronounced proximity effect, that can be noticed with many bulk material substrates. 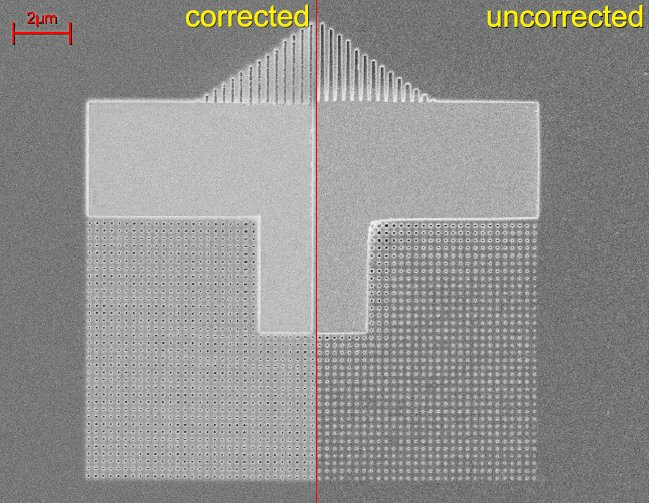 The narrow part of 24 nm of the contact was written as a rectangular area-element. 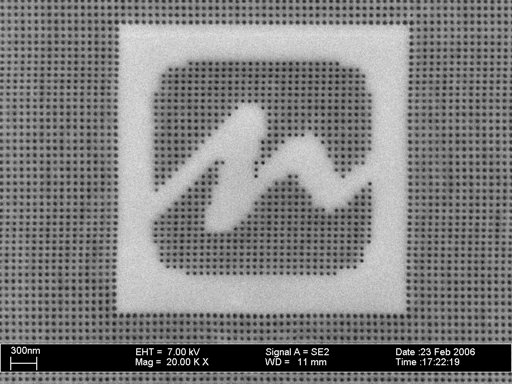 Focused-ion-beam micropattern of the logo of the University of Hamburg. 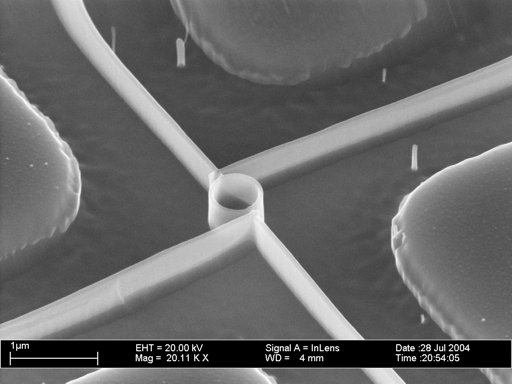 The structure was milled into a 70 nm Co/Pt-film deposited on a Si-substrate employing the bitmap import feature of eDraw. Hybrid-structure of an etched semiconductor AB-ring and a ferromagnetic ring on top of it: This example demonstrates the high alignment accuracy of the semi-automatic structure alignment for multi-step lithography processes. Another example for the high precision of our EBL-System: The line-array with a period of 500 nm was written as single-pixel-lines. 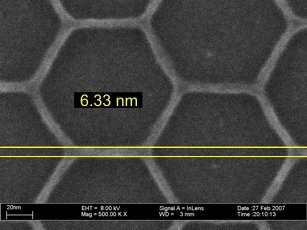 Again the PMMA-structure is covered with 5 nm of Cr in order to suppress the charging of the resist during image capture. 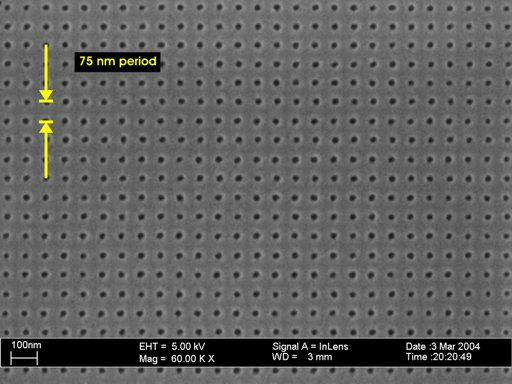 Dot array of 75 nm period written into PMMA of 130 nm thickness on a GaAs substrate: The whole structure is covered with 5 nm of Cr. Note the regularity of the diameter and the position of the dots. 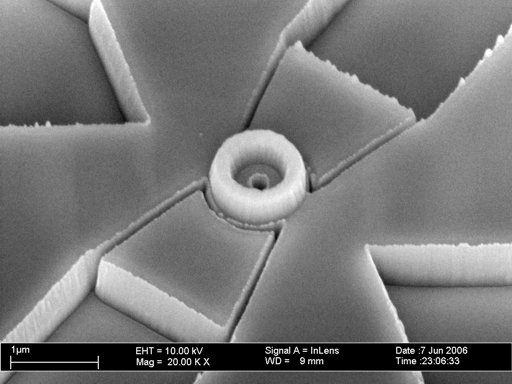 This cone was milled using an Ga-FIB into a Silicon sample featuring the circular milling mode. 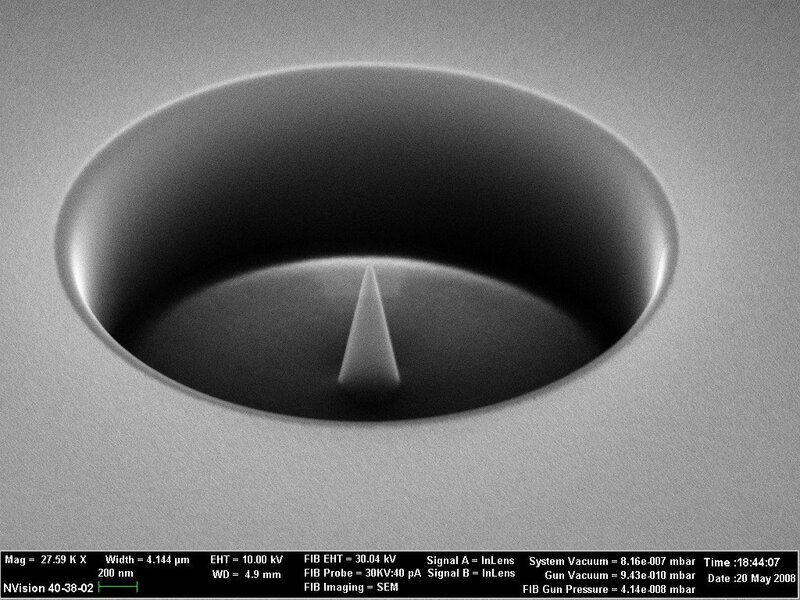 Mach-Zehnder interferometer structured on a GaAs/AlGaAs substrate containing a shallow two-dimentional electron gas (2DEG). 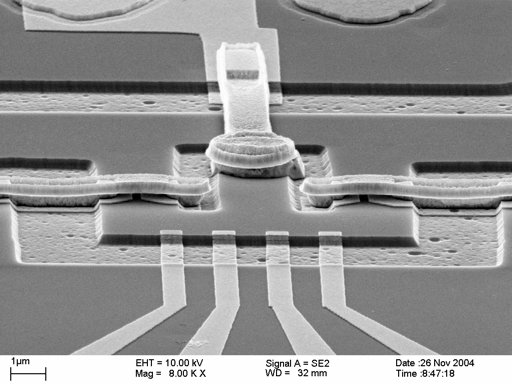 Air-bridge structured by means of a three-layer resist and evaporation of 25 nm Ti and 300 nm Au. The bridge spans 3 um and features a height of 400 nm.